Servicing hotels, motels, on-premise laundry, daily cleaners, hospitals, long term care, and other institutional and healthcare laundry facilities. Your guests remember every detail of their stay – clean rooms, soft linens, fresh scents, and essential amenities. We help you uphold the high standards within the laundry and hospitality industries by supplying quality facial and bath tissue, hospitality and hotel disposables, janitorial supplies, environmentally responsible products, and trusted laundry products designed to comfort and pamper your guests as much as you do. U S Chemical commercial cleaning, warewashing, and laundry chemicals and dispensing systems. Germ-X hand care and hand sanitizing products and dispensing systems. Windsor Karcher floor and carpet care machines. Laundry & Hospitality Products -- Order online or contact us to schedule a demo. Regional Distributors, Inc. is proud to be a premier distributor of advanced U S Chemical laundry chemicals and dispensing systems. As with many things, growth and success are accomplished with unparalleled quality, innovation, training, and support. 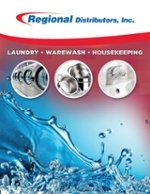 We are proud that U S Chemical has chosen Regional Distributors, Inc. as a premier supplier of their advanced laundry, housekeeping/cleaning, and dishwashing chemicals and associated dilution control systems. U S Chemical is a division of Diversey, the leading provider of cleaning and hygiene products to the institutional marketplace both locally and worldwide. Our strong local partnerships and best in class service and support paired with U S Chemical's easy-to-use, world-class formulas are helping our customers increase cleaning productivity, facility cleanliness, and hygiene – all while reducing operating costs and ensuring a cleaner and healthier environment. 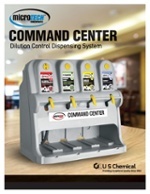 Totally Enclosed Dispensing (TED) System that eliminates the chance of spills and splashes during product changeover. 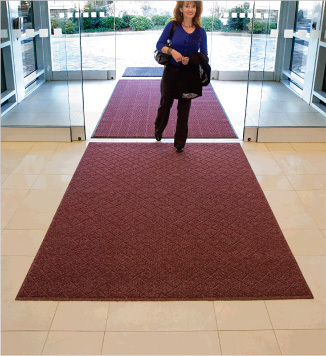 Safety Data Sheet (SDS) Binders are given to each of your location managers and Instructional Wall Charts are provided for displaying near all product dispensing and use locations. Routine and Emergency Service and On-Site Employee Training is provided by Regional Distributrors' trusted and professional Chemical Specialists. Our specialists have been trained by U S Chemical on proper sanitation and safety procedures, product application and use, and dispensing equipment installation and operation. Their focus is to deliver you timely service, quality results, safety, and controlled use costs. View our training video library for helpful how-to cleaning videos. Dilution Control Dispensing Systems control usage with accurate and consistent dosing and eliminates the time and money wasted associated with manual dosing. Super-concentrates also allow for reduced inventory, fewer change-outs, and less packaging waste. The easy-to-mount wall systems free up floor space and are customized to fit your needs with options for 4-button or 1-button units (1-button units can be also joined together), choice of bucket fill or bottle fill (each product slot can be adapted per desired fill), and adjustable dilutions for maximum performance. Committed to sustainability to meet your highest green standards. U S Chemical's plant is ISO 9001 and 14001 certified that guarantees efficient and sound environmental procedures are followed, consistent quality of products, and insures compliance of state and federal regulations. 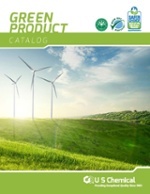 Their commitment to sustainability is evident throughout their product lines that include: post consumer corrugate, 100% recyclable bottles and canisters, NSF, Kosher, ozone friendly, rapidly biodegradable surfactants, and EPA Safer Choice and Green Seal® certified products offering highly concentrated formulas, which require less packaging and freight and a complete line of High Efficiency (HE) laundry products. developing customized solutions for floor care, warewashing, laundry, and environmentally responsible practices and programs. examining your floor labor expense and recommending cost cutting measures. determining the most efficient products and quantities to help you save time, money, and resources. ensuring you are knowledgeable about the latest industry products, advancements, and trends.